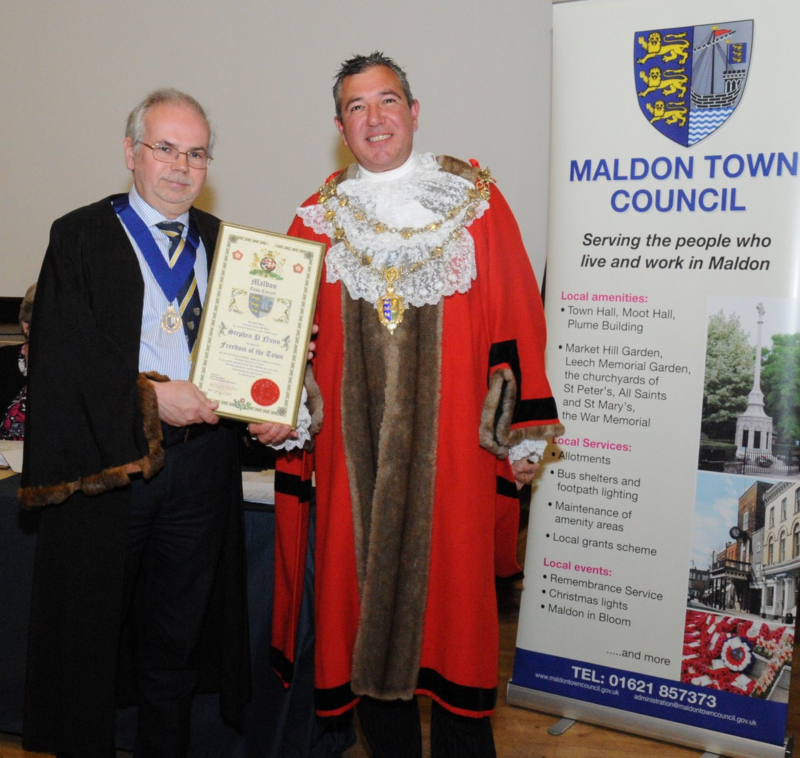 1902 was the last time that a Freedom of the Town was granted in Maldon. During much of the latter 20th century this honour was removed from the Town Council to bestow, but by legislative changes this has been restored. The importance and significance of bestowing such an honour on a local person cannot be underestimated. The criteria is stringent and the bar set high. It is granted in recognition of an exceptional contribution to local life that is above and beyond even the most worthy. At the Maldon Town Meeting on Tuesday 18th April this year the first grant was made for over 110 years. “It is my privilege and honour to this evening make an award of the Freedom of the Town. Before I name the recipient let me recite a synopsis of the voluntary work undertaken locally. Historian, antiquarian, lecturer and author on local matters. Former Trustee and Committee member of the Friends of the Moot Hall and School Governor – St Francis, Maldon. Founder member of the Maldon Archaeological Group (I’m sure most of you have it now). President of 1207 (Maldon) Air Training Corps Squadron and Vice President of the Maldon Branch of the RNLI not forgetting Town councillor and formerly both Deputy and Town Mayor. It gives me great pleasure to invite Stephen NUNN to step forward and receive the highest civic honour this Town can bestow on a citizen. Stephen – on behalf of the People of Maldon I present you with this scroll and hereby announce you a Freeman of the Town”.